There’s no survival skill that is more important than knowing how to build a shelter. This is not only useful but actually a lot of fun. If you like to go outdoors or camp, then you’ll want to learn how to build a shelter. For once, don’t bring your tent or sleeping bag, but use nature and the environment to protect yourself from different weather conditions. The best way is to practice while you’re out camping with your tent and equipment. This way you can protect yourself if something goes wrong. However, remember that realistic situations are different at times, due to all of nature’s variables. I’d suggest you practice building a shelter in summer as well as in winter. The consequences of failure are more drastic in the winter. There are a few different techniques you can learn. Now, most people think it’s hard to build one on your own. Though that’s not necessarily true, you will need a little practice depending on the technique you choose. Anybody who knows anything about survival knows that food, water, and shelter are the most essential elements. A shelter can protect you from the rain and keep you warm. In many cases, it protects from wildlife. More often than not, shelter means survival. For this reason, it’s crucial you know how to build one in all circumstances. Since situations may vary, it’s important you learn how to adapt and build a shelter with different resources. Imagine you get lost while hiking or maybe even caught in a storm. Then you will definitely need a shelter that is durable and can withstand the elements, just in case it takes days or even weeks for someone to rescue you. It’s essential to be able to make decisions quickly and be able to survey your surroundings and decide how to optimize the building materials you have at your disposal. Remember, it’s all about your resourcefulness and not your resources. Below are several steps on building a shelter. Choosing a location for your shelter is crucial for many reasons. The wrong location may result in a disaster quite easily. For example, what if the location you choose is in a flood zone? Keep in mind how long you will be possibly using the shelter and look for a proper location based on that. Long-term shelters need different things than those that won’t be used for a long time. If you think you’re only going to use the shelter for a short amount of time, then look for trees, caves, and rocky overhangs. Fallen trees, as well as trees in general, are a good shelter because they have many parts you can use. You can use the trunk for support, branches for framework and foliage for insulating material. Caves and rocky overhangs are good options, but it all depends on the time of the year. Though these are excellent to take cover in, they’re often a bit risky. If you’re in desert terrain and can’t find any trees, don’t panic. You can use the slope of the land for protection, or the steep side of a dune. Pay attention to the gradual side because that’s the one that indicates which direction the wind is coming from. For this reason, the steep side is a better refuge. In winter, finding shelter is a little trickier. Usually, building resources are under snow or frozen. However, snow has a similar insulating effect as a shelter you’d build from sticks. It’s crucial you remember to seek shelter that’s dry. If it’s raining, look for the ground that won’t end up under water. If you want to build a long-lasting shelter, you have to consider other factors. Look for areas that are near food and water sources. Try to find an area on higher ground to give yourself a better vantage point and visibility of the landscape, and it turn, you’ll make it easy for others to spot you. Still, use common sense and logic in this case. If you think you’d be safer somewhere hidden, make sure to find a location that’s harder to find. If you’re lucky enough to have some supplies with you, there are ways to use them to build a shelter. If you maybe have a tarp, that’s great, because you can use it to build one of the simplest types of shelters. Lean poles against a tree trunk in a manner that will allow you to cover them with your tarp. Of course, remove all sharp edges, so you don’t rip the tarp. If you maybe have some kind of rope with you, you can tie it between two trees and drape the tarp over. Place some rocks on the sides to ensure your tarp doesn’t move. If it’s an emergency situation, ditch the frame and wrap yourself in a poncho. Find a sheltered spot or crack in a tree to hide until morning. This is convenient, easy to build and useful in many situations. It’s great for one, or maybe two people. Find dirt, twigs, leaves and all other debris and create a mound. Then get larger sticks to frame the mound with. Of course, make a hole that’s big enough for you to crawl in. Don’t forget to cover that hole later to block air flow. This traps your body heat inside the shelter and keeps you warm for a while. If the ground is covered in snow, you can still build a mound out of it. You may think that’s not a good idea because snow is cold, but it actually works well as insulation. The mound will trap your body heat and protect you from the outside elements. This is one of the best shelters you could build if the resources allow. In most cases, it provides protection against rain and wind. In a typical lean-to, you can fit about four people, but you can also make a larger one to accommodate more. It takes a bit longer to build this shelter, and depending on the weather conditions and materials you have at hand, it can take several hours. Look for fallen trees and branches that are low enough to support the ridgepole (the highest point). One tree will do, but if you find two that are near one another, lay one branch between them. Now find another five to six poles that you can lean against the ridgepole. Lay them at a 45-60-degree angle, and now, you have your grid. For the frame, attach up to six poles across the frame. Weave between the poles using flexible branches and then use leafy branches to build the roof from the bottom up. If you have a tarp or an extra blanket, you can use it as a curtain. 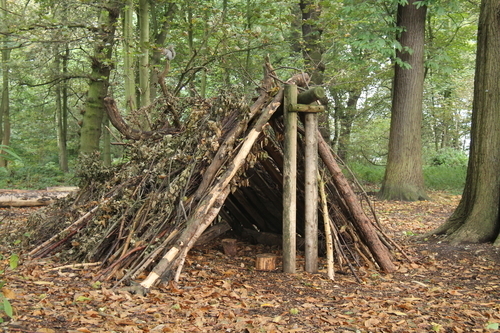 This type of shelter is somewhat similar to the lean-to. The difference is that the ridgepole should go from the ground and all the way into the tree. Make sure it secured at a height that still provides enough space for people to maybe sit underneath. That way, these two sides create the A-frame shape that is more protective from cold. For some additional warmth, you should build a fire near your shelter. You can build a teepee around the slender trunk of a tree or stand alone. If you can, use a slim tree as the center support and build the shelter around it. Attach poles around it in a cone shape. This is a sturdy type of frame but doesn’t provide as much interior space. For ventilation, there are two variations to choose from. You can only leave the top open, but that isn’t always a good idea because of rain. I suggest you secure the top and leave an opening at a side. Ventilation, however, is crucial in all cases. If you’re going to build a fire inside, you must leave an opening somewhere. If you’re building a stand-alone teepee, you’ll need three long straight poles and some type of rope. I’d suggest you try and find a pole with a Y-shaped joint at one end. This gives stability for the next pole to rest within the Y-shaped joint. Continue adding pairs of poles and join them using tripod rope. Of course, join them at the top, leaving the base wide. Once you have the frame, fill in the gaps with vines, leafy branches, grass, and mud. Go from the bottom moving upwards, so when it rains, the rain drips down the layers. If you’re in need of a short-term shelter, this could be a good option. To create a warm place, simply hollow out a mound of earth. One of the best locations for this is the root base of a fallen tree because roots have structure. Also, if you’re in need of a long-term shelter, then you’ll need to put a bit more time and effort into it. Long-term subterranean shelters need to be built in advance. These shelters can be completely equipped, furnished, and can even include power supply. Ramada isn’t really the best idea if there’s any chance of rain, but it’s ideal to protect from the sun. Sunny areas require a shelter that provides shade and air flow. There are a few different Ramada’s you’ll find but most are based on the same idea. Ideally, you need four posts, some beams, and a covering. You can use mats and tarps to cover the roof, though you can use brush, too. I suggest you build a movable wall that you can add if the temperatures drop during the night. This is a versatile shelter that can protect you for quite some time. This type of shelter is truly only to protect you from disastrous situations. If you find yourself in need of a dependable home, you can build one using what the land gives. Of course, building a log cabin takes a lot of effort, time, and resources, so it’s good to know the basics in advances. For a long-term cabin, the idea is to lay a frame made of logs that interlock at corners. Before you start with that, you must prepare the ground first. Clear the land of grass, level it, and if you can, lay it with gravel. Find some large rocks that can serve as stilts and place them at all corners, every four feet. Find the base layers of logs that should be larger than those you’d use for walls. I suggest you find those that have about 12 inches in diameter. For the walls, find trees that have about 10 inches in diameter and cut them into dimensions of your floor. Flatten the top and bottom and notch the ends to interlock them. Ideally, you can cut a notch in the top log so no water can pool in the joints. After you build walls to the desired height, you want to build a roof with sod, split logs, or cut shingles. If you find yourself in windy conditions, I suggest you build a wedge tarp. This is best for constant prevailing winds because of its aerodynamic shape. This stands to resist strong winds and rains for quite some time. Because it has five tie-down or anchor points, this shelter is more secure than some other versions of tarps. More so, it has two corners that act as rain catchers. Stake down two corners into the wind and then tie up a line to the center of the opposite side. Tie the other two corners into the ground. Make sure to use a less steep angle for better ventilation. The last corners should be tied sharply if you want the shelter to be waterproof. To catch water, place a few rocks under the tarp to the first tie downs. Though this isn’t really a shelter, it’s a great addition to whatever shelter you decide to build. You’ll need bed regardless of where you’re hiding, so it’s good to know how to make this. You’ll need leaves, evergreen boughs, grass, and whatever other plants you can find. Most commonly, you’ll find pine and cedar boughs, though beds made from fir are more comfortable. To make a frame for your bed, roll two logs side by side. Make sure they’re about 3 feet apart, too. Also, keep your height in mind since the frame should be longer than you are tall. Fill the frame with boughs, grass, dead leaves, etc. Now, when you lay down, the surface will probably flatten which is why you should make the mattress thick. The more vegetation you add, the more comfortable and warm will your bed will be. No doubt, different tools, and materials can be highly beneficial when building a shelter. 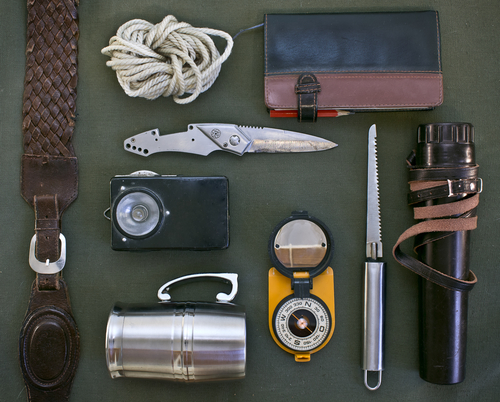 There are some items you should always bring with you during backpacking expeditions or hiking. To know what items are the most important, think about all of the possible scenarios you may find yourself in. In most cases, you’ll do some de-branching, cutting, lashing, notching, weaving, and digging. Think about which tools could help you the most, or even better, if you have one tool that could do several tasks. I’ve come up with a little list of useful tools and materials (see more tools on our main page site) you should keep handy. Multitool – you can use it to cut through small branches, loosen knots, remove flakes, etc. Hatchet – there’s no better tool for de-branching and cutting. Instead of dulling your knife, use a hatchet for larger cutting. Fixed blade knife – this is ideal for cutting small branches and cords. Use it to remove bark from logs and notch poles. Lightweight tarp – as I mentioned, a tarp is a must for some of the easiest shelters. You can use it as a roof or to wrap around yourself for protection and warmth. Tri-fold shovel – a shovel is best for clearing and leveling ground and digging in the dirt or snow. Some difficult tasks that could take you a lot of time and energy are easily done with a shovel. Cordage – if you don’t have cordage, you’d have to improvise with different materials in the woods, which is not at all an easy thing to do. A cord is useful for lining between trees for a tarp shelter or lashing framework. You can even use it to hang your supplies. Survival blanket – ideal to use as a roof of your shelter or to wrap around yourself for warmth. This, too, is great for hanging supplies in mid-air and out of reach of animals. Zip ties – these are easy to carry around and can substitute a cord at times. Lighter and work gloves – a secure light source is great to have around as opposed to having to build a fire from scratch. Work gloves are also handy because branches and trees can easily poke you. Flashlight and spare batteries– there’s really no need to explain how a flashlight could be useful in the wild. Not only you can actually navigate around when it’s dark, but the light may be useful to scare away some animals or such. If your survival flashlight has disposable batteries, make sure to bring a spare. If not, remember to always recharge the batteries. 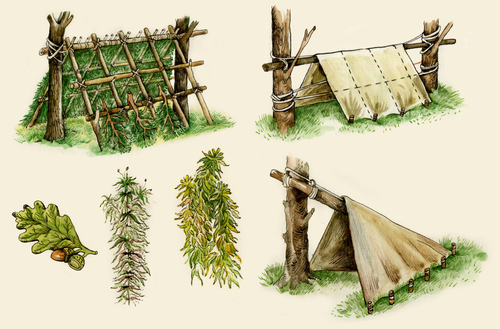 We’ve discussed the best shelters and how to make them, but as you probably noticed, some specific skills could be useful. In almost all cases, you’ll have to do some lashing, tie a few knots, etc. Regardless of where you want to build your shelter, be aware of the wildlife that is surrounding you. Use common sense; if you think the location is great, someone else probably thought the same thing. Search the grounds before you build your shelter. Sometimes, there are snakes hiding in leaf piles. Some creatures may hide in bushes, too. Simply, use a stick to check before you reach with your hands. The best is to hang your food up and away from the animals. Other than wild animals and creatures, there are a few other things you should be careful of. If you notice a white, chalky appearance, stay away from it. In most cases, this is mold that could impact your health. Trees that have lacey leaves are usually infested with insects, so avoid them at all costs. Other than that, use your best judgment. If a location seems suspicious and somewhat dangerous, it probably is. Open ridges and mountaintops are not the best places to build a shelter on. Those places are exposed to wind, so you’ll not only be cold, but your shelter may actually fly away. If you notice the ground is wet or damp, move camp. It’s hard to build on damp ground, plus, it wouldn’t be good to sleep on it. Avoid the bottom of narrow valleys as cold winds will pass there at night, and it would be quite hard for you to warm-up if you build your shelter there. Be careful of watersheds and ravines. These places are especially dangerous if it rains because the water may run right in and drain your shelter. I know it may sound difficult and complicated at first but building a shelter can also be fun. It’s a good thing to know, especially if you’re often exploring, hiking, or camping outdoors. With a little practice, you can master each of these ways to build yourself a shelter. However, make sure to always bring some helpful tools from the list above. Those can be highly helpful, and the quality of your shelter depends on them. If you’re caught off guard and don’t have any items to help you, use the land around you. You can find all you need in the woods, so pay attention, use your best judgment and of course, be careful. Don’t wait any longer! 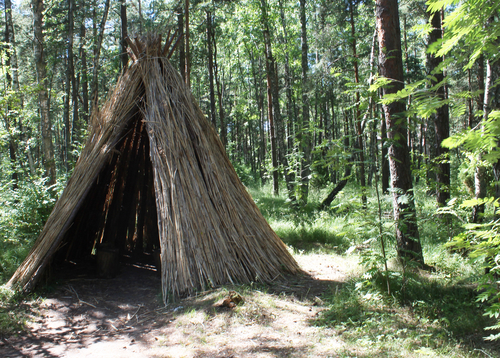 Pack a tarp, flashlight, and a multitool and go outside to practice making one of these survival shelters. Make sure to practice in sunny as well as rainy weather since weather conditions make all the difference.